The first season of Marvel's Iron Fist took a critical beatdown the likes of which Daredevil, Jessica Jones, and Luke Cage avoided. 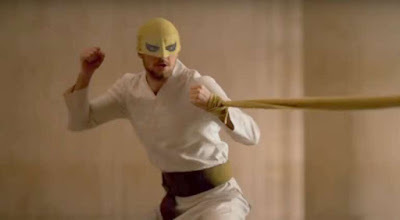 While those shows received praise, and their stars highly-regarded by fans, Iron Fist and its star Finn Jones were largely ridiculed as outliers. I'll never forget when The Defenders cast was introduced at Comic-Con last year it was only Jones who was met with a resounding silence. After a well-received Power Man/Iron Fist teamup episode recently, and new showrunner Raven Metzner (Sleepy Hollow) brought on to lead Iron Fist season two, the kung-fu hero may be looking to rally. The first trailer for Iron Fist season two already has me won over because it finally gives us the classic costume. I was wondering how and when they would work it in. The teaser is short, but it shows Danny Rand (Jones) and Colleen Wing (Jessica Henwick) walking down a New York street where everything seems to remind him of a past experience in Kun Lun. In one scene we see what appears to be Danny battling Davos (Sacha Dhawan) for the mantle of Iron Fist. It may start off graceful but sure doesn't end that way. I'm expecting Metzner to really dig into the myth and the lore of the Iron Fist, while taking the character into grittier corners of Marvel's street-level brand. I'm optimistic. Sadly, it's been confirmed that Rosario Dawson won't be appearing in season two, but you can expect Alice Eve, Simone Missick, Tom Pelphrey, and Jessica Stroup. Iron Fist season two hits Netflix on September 7th.